They’re cute pants! I’ve made this pattern five times and with my first pairs I was definitely hesitant about wearing them out of the house, they almost feel too comfy to be decent or something! But now they’ve become great ‘weekend’ pants and a total summer staple. I wear mine low though and have raised the crotch to compensate, but I do think that they are meant to be worn high, as you do. 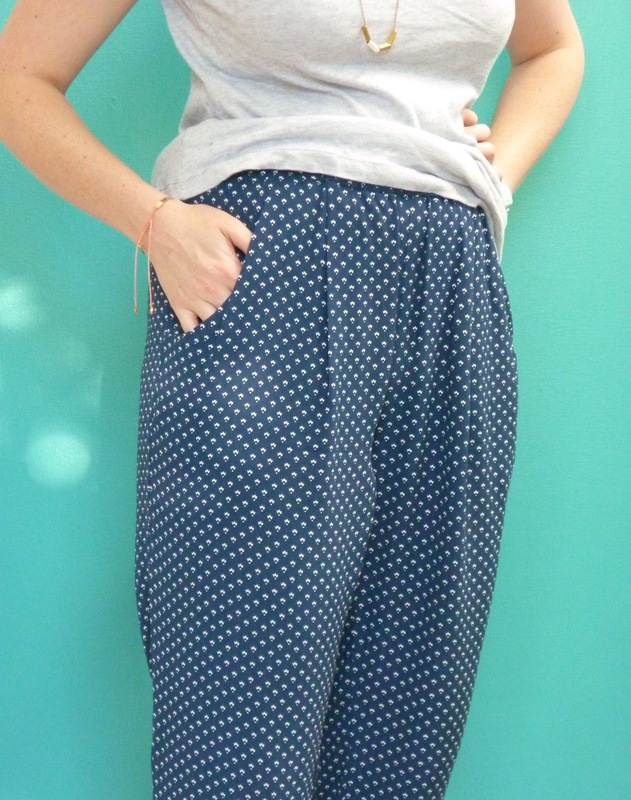 Generally I wear them with a woven top like simplicity 1366 but have worn them with a lark tee as well. They work really well in linen too! Thanks Bella, glad to know its not just me! I’m sure I’ll wear them more once I figure out what tops I like them with. Linen sounds awesome! Cute, especially with your sparkly shoes (I tried them on but fortunately or not fortunately they didn’t fit). Anyhoo have you a fitted scoop tank? I think sometimes with a fuller bottom half something pretty tight on top helps to balance it out…. They look so stylish and comfortable! I did not think they looked like Pajamas at all when I initially saw them! I think these look great on you. They look great with your gray Lark tee and I really love them with that striped tee in the last photo. I would wear them out of the house with either top! Thanks Teri! I should just start wearing them out, I’m sure I’ll get used to them. They’re just a bit different to my usual! You can Totally wear these out of the house. They look Great on you! Those are just the kind of pants I’ve been craving recently! I think you look great in them, but I understand the styling challenge. Let me know if you figure out the perfect companion for these! Will do! I’d definitely recommend the pattern, if you’re looking for one, I think its pretty versatile depending on the fabric you pick! 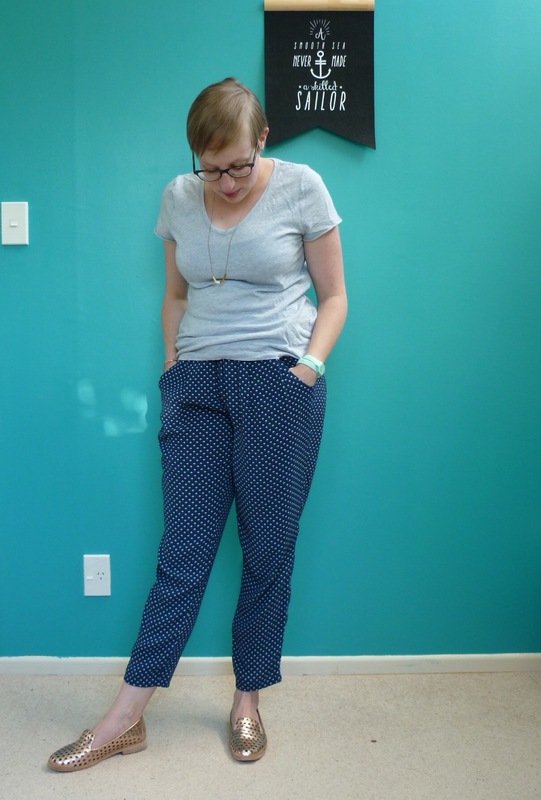 I really like these pants, but I totally get the styling issue. 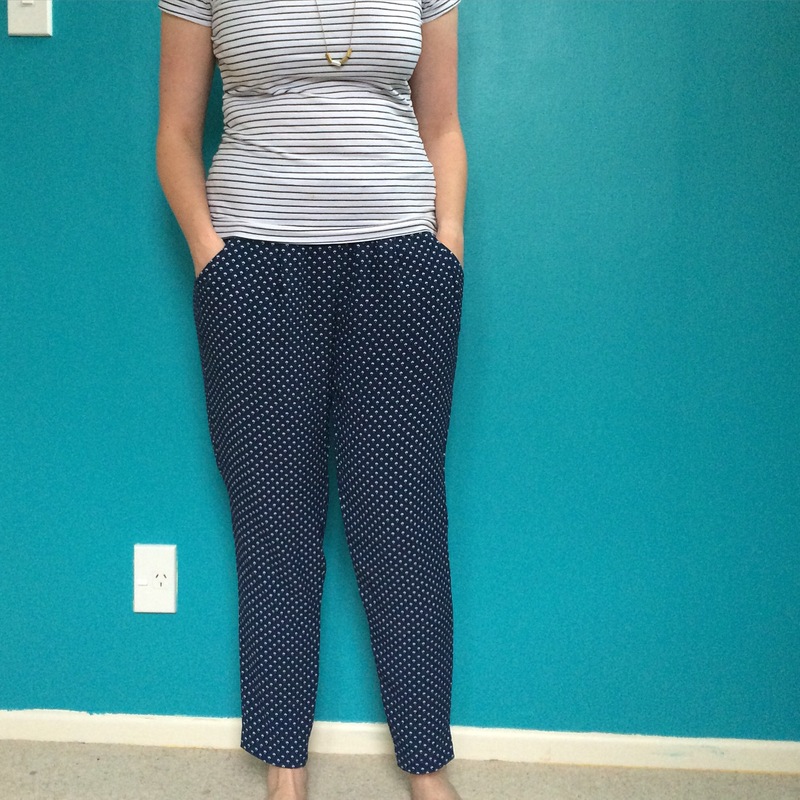 I made a couple pairs of woven Hudson pants and I have the same issue, what do I wear them with? I think a Ruby top would look great too. Maybe some accessories would help too. Also I totally get the ironing thing too! Oh it looks great on you! 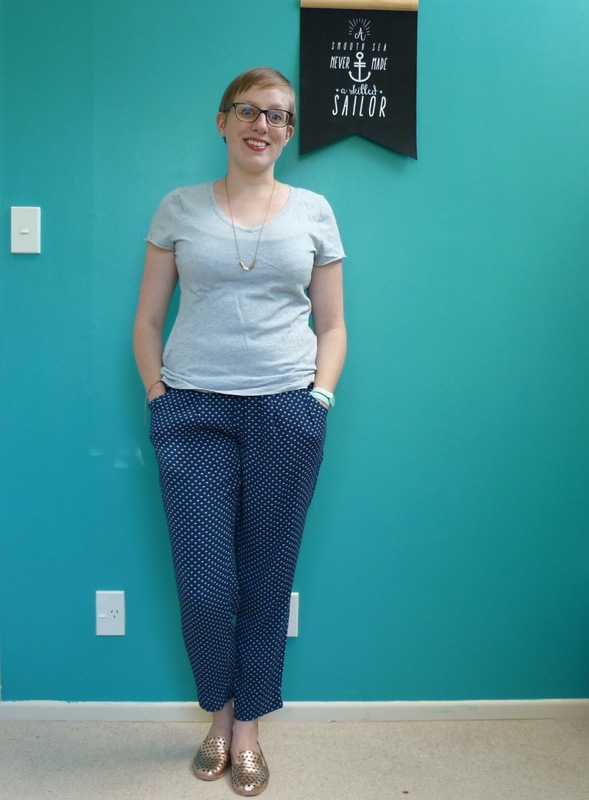 Casual but not frumpy, and I love the hint towards pajamas land with the fabric+pattern combo. I think it looks classy and self-confident. I usually pair my Alexandria with loose fitting tops, and am now making a couple of cropped Lindens (that’s how I found you blog BTW). 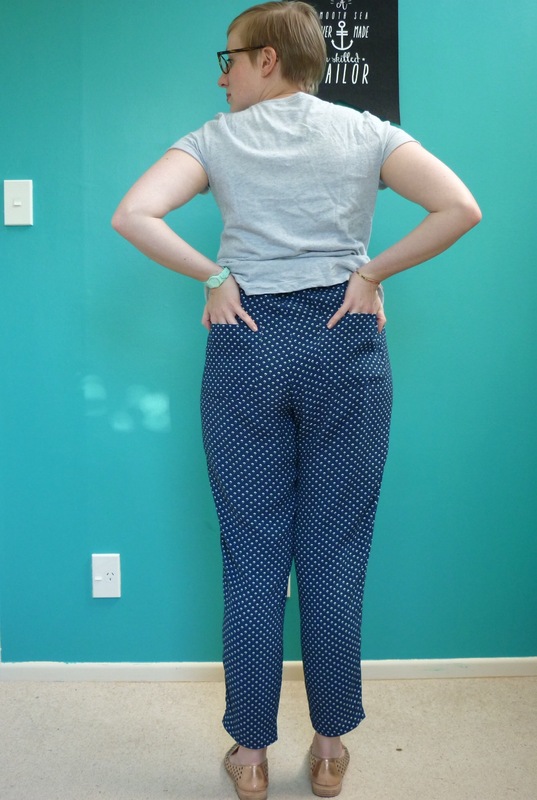 I think the length of the cropped Linden can complement the higher waist of the pants. Another option is with a Blazer – have you tried the Morris from Grainline? (Sorry if I missed a post I’m new to your blog). Thanks Roni! A cropped jumper like linden is a really good idea, I’ll have to think about what fabric I have that could work. I haven’t tried Morris yet, but I’ve seen some awesome versions so its definitely on my radar!